Our transition age special education students focus mainly on job skills and we are always looking for more real jobs that they can complete in our school. One of the teachers in our program came up with the most awesome coffee business model that was started this past year and has been a huge success! Teachers order their drinks in the morning through a google form, and then students make the drinks using Keurig machines and deliver the coffee to specified locations at specific times. The teachers throughout our school love their coffee...the students baristas love the responsibility, it's a win-win situation! And even though this program is for our transition students, my class gets to help out when the transition classes are out on community trips and I have been so impressed at how quickly my students have learned the ropes and how seriously they take this responsibility. Here's what our google form looks like. We have it set to open and close at a certain time each day, this way we make sure no more orders are submitted after we print them off! In the morning, after the google form has closed and all orders have been submitted, the orders are printed off and arranged by time (we have two time slots we deliver). The orders include information such as who ordered, pick-up location, time, type of drink, and types of sweeteners/creams. Higher level students are able to take a label, attach to the cup, and complete the order on their own. Lower level students, who might not be able to read, are still able to do a lot independently due to the supports we have put in place. 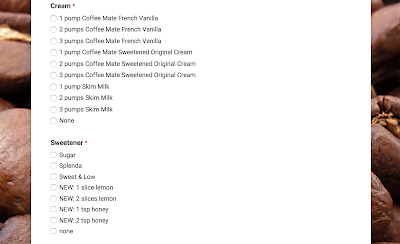 For the Keurig's, students are taught to always choose the #3 or largest size option when creating their drinks. As you can see here the creamers are labeled with both letters and colors so that staff can tell students, "1 pump red" or "2 pumps of B." Similarly, the sugar/splenda/sweet n low are different color packets so it is easy to tell a student to put in the "yellow" packet, or whatever it might be. We have learned it is most helpful to put the creamers and sugars in first, before the cup is filled with a hot drink! The coffees and teas are organized so that non-readers can be successful. Staff can tell students, "get a coffee from the blue basket", etc. When a drink is prepared, it is then transferred to this cart for delivery. 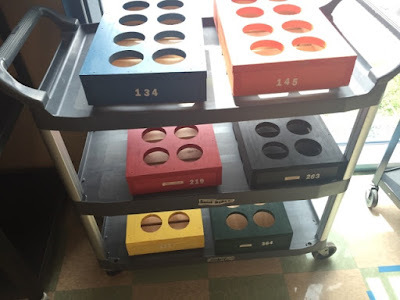 The label is either marked with the correct color, or staff tells students what color box to put the cup in depending on where it needs to be delivered. The coffee/tea is delivered by the students to the various pick-up locations where teachers will pick up in-between class periods. Teachers are billed at the end of the week for their weekly orders. Each drink is $1 each. This has been a HUGE success at our school and is a great fundraising opportunity as well! A Keurig machine - I bet someone has one they would be willing to donate. Otherwise you can find great deals at Kohls with a 30% off coupon and Kohl's cash! You will make the money back from this investment! Drinks / K-cups - You can also find great deals on K-cups with coupons, or at ALDI, or even just on Amazon. 30-40 cents a cup is a good price to pay. Use subscribe and save on Amazon (and feel free to cancel once you receive your order) for a bigger discount! These breakfast blend K-cups are 34 cents each. Keep it simple on the flavors - I would recommend starting with just two types of coffee (decaf or regular) and maybe a hot chocolate. For tea, we actually just brew hot water and then let the tea bag seep for 5 minutes. Creamers / Sugars are nice to have for those who like to sweeten their coffee! Buy in bulk! The links above are affiliate links, so while it costs the same for you, I get a small percentage if you choose to purchase anything from those links. Thanks! Do you do any similar jobs at your school? Please share! We are always looking for more opportunities for our students. I will be posting about some of the other school jobs we do soon, so be sure to follow me so you don't miss anything! Thank you for posting this. I love this kind of post. One of my high schools is doing this but I haven't been involved to know the details. So cool to share the details for other people to try. Love it! This is AMAZING! I love that it's filling an actual need-- I know I'd love coffee brought to my door! Such a great idea! I was thinking of doing something like this next year with making copies. This gives me some great ideas! Yes, we do copies too!! We have a "center" set up in the main office, near the copier. Teachers fill out a slip- how many, stapled, hole punched, etc...We ask that they give at least 3 days notice! We aren't allowed to have our students make copies, but we do deliver them to classrooms for teachers!! We do a monthly "Cafe 100"...we have alternated breakfast and lunch based on teacher surveys. The teachers request a student to come and take their order via a google sheet. The week of, students go to the classrooms to take orders using the order form. Students only need to circle the items and during which lunch wave they want it delivered. Some students help with food prep, others deliver, collect money, and make change. Teachers really seem to like it! We only did it the last 3 months of the year, but will definitely continue next year. We also do a bagel delivery on Fridays. Teachers email me with their orders, students deliver bagels, make change, etc,. Yeah, love this idea! Even if I can't get the school to run with it regularly maybe it can be a special occasion thing! Thanks for the awesome ideas!! LOVE sharing! This is exactly the type of thing that I was looking for! Love this idea! Ok, I have permission to offer the Coffee Delivery Service. 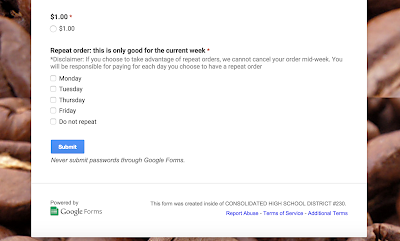 I have created the Google Form. But I have no idea how my teacher's will access the form. Do I send it out twice a day as we "open" for business at 8 and 12? Does the form save to their google drive after the first accessing of the file? Do I upload it to my teacher's website? This is my first Google Form to create so I'm clueless! It was super easy to create though!! 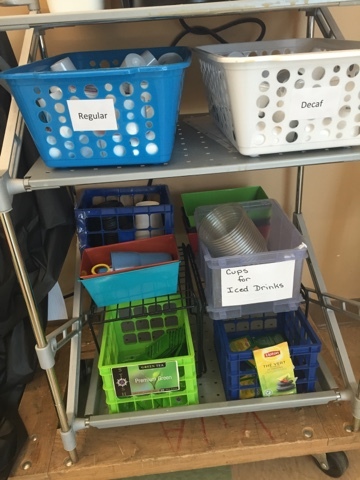 Also, I am sending home a Donations Request List letting the parents know about our new coffee delivery service, and letting them know we will be accepting donations of the creamer, sugar packets, k-cups, disposable coffee cups with lids, and coffee stirrers. 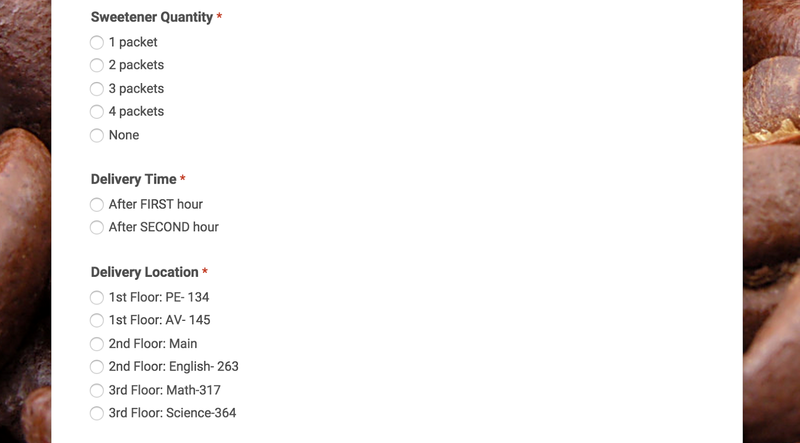 I would remind teachers to bookmark the order form page and send out every once and a while. You can also make a QR code and print so teachers can scan and order from their devices. Do whatever works for you and your school!!! I loved this idea so much we are doing the same this! It is going really well. Our biggest frustration is the billing. How do you keep track? We bill weekly. Some teachers owe, some pay with exact change, some have a credit....it's quite a bit of work to keep track of that. How do you do it?? We also bill weekly and say they must pay in exact change only. We also offer "tea-jolt bucks" which they can purchase and can use these to pay their bills too. They need to keep track of their physical tea-jolt bucks, not us, which helps with the whole credit thing! Hope that helps!!! The high school that I graduated from did this. The kids went to Costco once a week to get the supplies. I thought it was a great idea and our school's coffee shop was very busy every morning. This is so fantastic. I love this idea for my middle school autism support class! 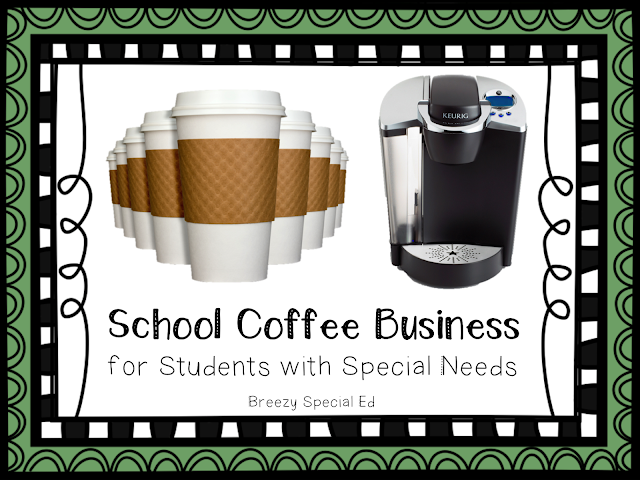 I actually called Bed Bath and Beyond -- they only asked for a letterhead detailing what supplies I need to get started, and they are DONATING a brand new Keurig as well as K-cups and disposable cups for us to get started (before the teachers pay)! A great place, if ya ask me! Thank you again for all of the specific details and the photo support. Where did you get the drink holders? Those were custom made for us. Where did you get them made at? I am really hoping to get admin approval for this to start in September! Jessica, one of the teacher's husbands made them for us! I hope you can do it. Good luck!! brie, is the cup holder wood or styrofoam? how do you label your cups to know where they need to be delivered? I want to thank you for posting this. Thursday was my first day with my "coffee shop" at my middle school. I teach Grade 5 & 6 substantially separate students. Most have a learning disability but a few have intellectual and communication disabilities. 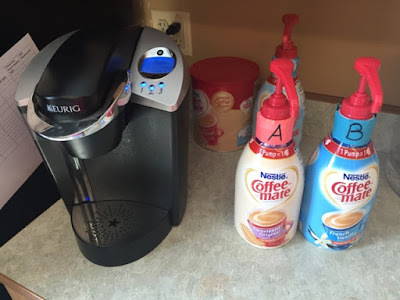 I was VERY lucky to have my K-cups donated along with creamer, cups, lids, and sugars. My students had to get parent permission and all by 1 has returned the slip. I chose the first 4 who turned in their slips to start. Teachers were emailed the Google form to complete. I labeled the coffee cups with what the teachers ordered and the kids had to complete the order and deliver it. It was such a success!!! Teachers who normally don't talk to me were raving about it and asking if we could add food to the program as well. But this is not the real reason I'm writing this. One of the four who "worked" on Thursday was just diagnosed with an Intellectual disability and really struggles formulating complete sentences verbally. We just had his IEP meeting where Mom was told how his testing scores probably won't improve. She was obviously upset. I called her on Friday to let her know how proud I was of her son. How even though his scores were low, he was able to complete orders on his own and did a WONDERFUL job. She was so pleased not only did she begin to cry, but my principal and secretary who were listening to the conversation also began to cry. If you hadn't posted this, and if I hadn't been procrastinating and found this on Pinterest, I still feel as though I wasn't doing enough to help my kiddos. Thank you for all that you do and helping me teach my students a valuable life skill and to make them productive citizens in our urban community. What a wonderful, heart warming story! 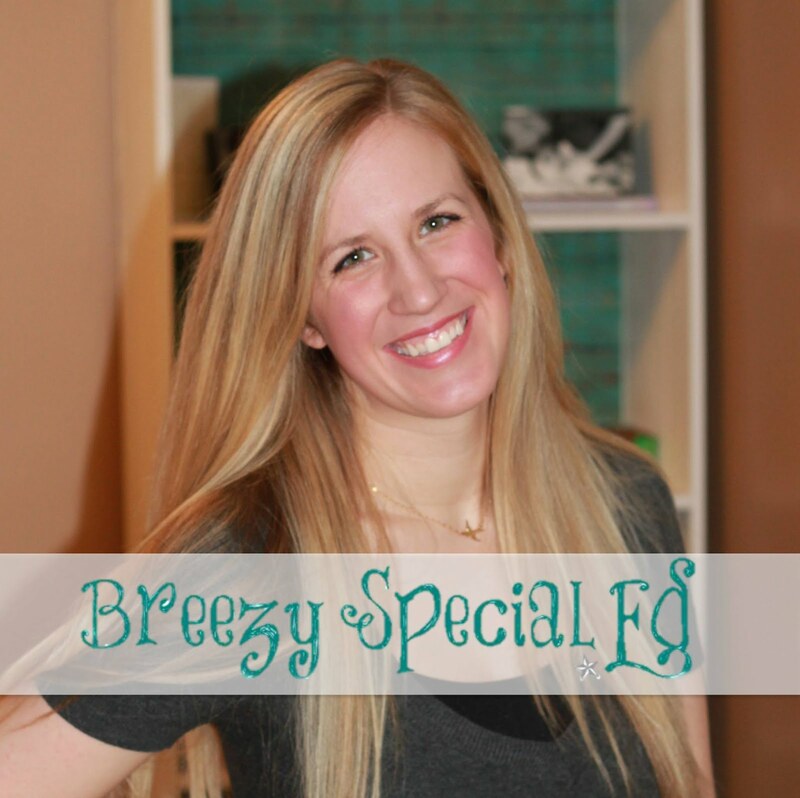 THANK YOU so much for sharing your story. I'm so glad I was able to share this idea with you to use with your students. Best of luck to your and your students and you guys continue this experience! Hi Melissa, would you mind sharing the permission form you used? I just pitched my Coffee Cart idea to my superintendent this morning and he was very excited about it. He really wants to see it come to fruition. While we were talking, he mentioned liability/insurance concerns. Like for instance, what happens if a child spills coffee and burns themselves, or if a teacher spills their coffee and something happens to them? What measures have you put into place if this were to happen with you? What kind of permission slip did you send home to the parents? I thought I would put this question out there and see if anyone had any helpful feedback. Thanks in advance! Great question Michelle. We did send home permission forms for students who worked it. And we were also very careful about who we let handle hot cups and had staff help students when it was questionable. I am in the process of starting this with my post secondary SCI room. All of my students are non-readers. Is there a way to have the order print with pictures? Not that I know of, but let me know if you figure it out. That would be awesome! We just opened our school store and we have found that some people just can't leave their classrooms to get to us during the day. We are hoping a delivery service like this helps. 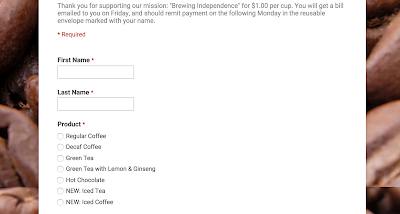 The Google order form is a great idea, especially since our menu is constantly changing in our store it is difficult to keep printing out new paper copies to distribute. If we can get this to work I'm hoping when can offer all our products with delivery. I am a first year teacher and just accepted my first job in a middle school life skills classroom. When I met with the other life skills teacher she never mentioned anything about having something like this set up but that students do grocery shopping and what not as one of the three outings we do each week. I am thinking that once I get our IEPs and the ones specifically in my classroom (we have over 100 students between the 2 of us on our caseload! crazy right? well seems crazy for our community) I will see what they are able to do and maybe try this on a small scale first! love the idea! over 100 students between two of you?!?! I can't get past that!! I am interested in starting something like this with my students in Middle School. I think they would love it. I am still in my beginning stages of thought and haven't brought my idea to my supervisor or building principal yet. But, my goal by the end of the year is to get it up and running! Hi! I love what you've done. We run Moka Hey coffee shop in Manvel Texas. We have loved serving our coffee to the faculty and staff! I love that you're doing it too! Like us on Facebook. Moka Hey coffee! Thank you so much for sharing this!!! I absolutely love it!! We currently run a café once a month where we serve lunch, restaurant style. It is an opportunity for teachers who don't get to interact much to come together. We also offer "to go" for those teachers who just can't get away for more than a few minutes. The menu is published early in the week so the teachers know what we are serving each month. I like the google doc idea though b/c we always have too much of something, or not enough of something else. Thanks for the great ideas!! We run a soup Tuesday, students can do Internal Work Experience and work in our School Kitchen. Every Tuesday is a different soup and at the end of the year they will put out a recipe book of the soups! I started this over 8 years ago. We do it for a block and even diploma bound kids can get a grade for it. We run it everyday. We use coffee pots and keep crafts with coffee, tea, hit chocolate, iced coffee and sweet tea. Teachers get discounts for weekly orders. My students do everything. They count inventory, deposit and collect money, make the coffee, deliver the coffee, make grocery lists, everything. Once a month we sell donuts as well. The students fill out time sheets. They get paid and must deposit it into their account. With this "money" they can buy various rewards. This teaches them to save for what they want and purchase things. My program has paid for all my class supplies and we are always in the black!! All the money goes right back to our program! Where did you get the cup holders for transporting the coffee? Did you ever get more info about this? We would love to add this to our coffee cart/cafe business! we do this at my school! Except I have picture order forms and I send my students around to the teachers to take their orders face to face. I have the teachers grouped by planning period and send a student each period to that group of teachers to take their order face to face. Since a lot of my students cannot read I use pictures on the form. The forms are laminated and students use a dry erase marker to circle what the teacher would like. We re-use the forms every week since the order form can easily be wiped off!! the teachers love seeing my students come to take their orders and its once less thing they have to do (like fill out a google form for coffee). Its great to have my students interact and practice speaking with people they are not familiar with. We do popcorn fridays at the high school and the students love it. There are different flavors and there is a sheet to fill out for the teachers who fill them out Thursday the day before or during the first period on Friday and then the special education students bring it around by the end of the period because it is an hour and 45 min period. How do you set a timer on your Google Form? I can't seem to figure how to close it after a specific time. Thanks for the help! This is a great idea and I am hoping to use it along with the push in support of speech and OT. At this time, my 6th graders do a weekly service hour loading food into backpacks for the school's weekend backpack program. They've enjoyed the project and I think they are ready for something new. I think my 5th graders would also do well with this project. Thanks for sharing! Keep up the good work. Your ideas are inspiring me to go the extra mile with my students. Could yo give me some hints on what to teach students prior to opening the coffee business? My superintendent just gave me the thumbs up to do this (I am really using everything you suggested!). Just need to know where to start before all of our stuff arrives! Im cutting it close since the new semester starts Tuesday! Yikes! We started a dog treat business last year. We have students with mild to moderate Intellectual Disabilities. The recipe is approved by the Department of Agriculture. They students make the treats, cut them out(3 sizes), bake them and sell them. So far all the responses to the treat are that the dogs love them! Do you have a copy of the permission slip you used? That is all that is holding me back at this point! Do you have a task analysis of the steps for making coffee? Where did you get the boxes you use to deliver the coffees or how did you make them?